There is probably much to be said for the notion that in every painter there is always at least one truly great painting. Nowhere is this more obvious than with the 18th-century artist Joseph Wright of Derby (1734-97) and his great work: 'An Experiment on a Bird in the Air Pump.' The picture below will link to a full resolution image of the canvas itself. It might take a while to load, but it's worth the wait. Click for a full-page, high-resolution image. Wright was born in Derby, England in 1734 and became a well-known portrait and landscape painter. He became associated with the 'Lunar Society,' one of many gentlemen's societies of Georgian England. It was composed of scientists, industrialists, artists and intellectuals from the area of the UK we call The Midlands, the centre of the Industrial Revolution. The Lunar Society was so named because it met on the evening of the full moon every month - not through any romantic impulse, it is thought, but most likely in order to get home easily and safely in the days before street lighting. Joseph Wright - self portrait around 1780. On their agenda would have been the enormous changes that were sweeping through society at the time. Of how people might benefit from them. In this context, many of Wright's paintings give the scientific and technical advances of the age the kind of almost sacred treatment reserved in times past for religious subjects. Think of a Baroque painting with the baby Jesus in the centre and all the adoring crowd around it, and you won't be far off track. Here is a fine example (which even has a white dove - the Holy Spirit -in a similar elevated position to the bird in Wright's painting). 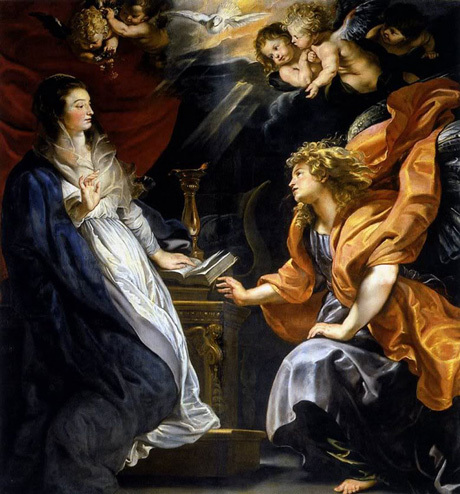 Typical Baroque-period devotional work - Rubens’s Annunciation. Joseph Wright's composition has a very different subject matter, however. It shows us a domestic scene during the middle years of the 18th century. An educational form of entertainment is being staged in someone's home. A local gathering of one or two families, perhaps. Those present are learning what happens to a living creature, a bird, in a glass chamber when deprived of air. People would make a living touring the country and delivering demonstrations of this kind. This is the occupation of the man with the long hair in the centre of the painting. The action here centres around an air pump, or 'pneumatic engine' - a fairly recent invention popular in lectures of the Royal Society in London. It was designed to explore the properties of the atmosphere and to demonstrate what happens to objects and living things when deprived of air in a vacuum. The insect could not fly in such circumstances; the bird would suffocate, and so on. This seems patently obvious to us today. But in the middle of the 18th century it was, for many, a radical idea - that the air might be a physical substance that could be measured and controlled. And although there had always been speculation on the existence of an invisible substance around us, the aether, for most people the quality of air was imbued with a sense of the mysterious. Even of the sacred. The Latin word 'spiritus' means breath. And our English term 'inspiration' stems from 'inspiratio' or 'inspirare,' which comes, I am reliably informed, from combining the prefix 'in' and the verb 'spirare' (to breathe). In fact, throughout the ages and in many languages and cultures, the word-root for ‘breath’ or ‘breathing’ has a very similar connotation. The Hebrew word for ‘spirit’ is apparently also the same as ‘air in motion’ or ‘breath.’ And there are numerous instances in the Bible of the breath of life being associated with the Divine. A similar correlation of meaning can be found in many other spiritual practices. There is the prana of Hinduism/Buddhism; or the ‘qi’ of Taoism, and so on. 18th Century, Georgian England was, likewise, an era in which most people were practising Christians. They went to Church. They prayed and they meditated. They believed in charity and good-neighbourliness and in the existence of the Holy Spirit. We cannot escape these associations when viewing this painting. They are the key to its interpretation. There are ten people present upon the canvas. Setting aside for a moment the itinerant gentleman in the centre commanding the air pump and the figure of the young man operating the window blinds over to the right hand side (and whom we shall return to later), what of the others, the spectators? The artist would not have wasted weeks painting in a figure that was superfluous to needs. Each one is here for a reason - to inform us, I believe, of just what was being discussed during those meetings of the Lunar Society. Why do I think that? Let's begin by exploring the group to the left. Here, we have a young couple, often described as ‘lovers’ and not at all interested in the experiment. Not sure I entirely agree with that. The great thing about this painting is the eyes, which are worked with such astonishing skill that you really can determine exactly where each person is looking (or not looking). And the young man with the snazzy lapels, after perhaps exchanging a brief word or two with his fiancée, is clearly wanting to get back to watching the experiment. He is probably thinking that this kind of thing is going to be the future, and he can benefit from it. Invention is in the air, a time of new discoveries and of rapid progress - the harnessing of hydro-power and the coming of the canals. James Watt had transformed the then-primitive steam engine into a powerful mechanical force. Richard Arkwright had commenced upon the mechanised spinning of cotton; and the earliest factories were being built in the painter’s very own county of Derbyshire. It all heralded the onset of what we now term the Industrial Revolution - a process that was to change the face of the countryside and the predominantly rural society of England (and eventually the world) forever. It would leave many a new millionaire in its wake, and this young man is going to be one of them. The young lady looking into his face seems to sense this, and is ready for the consequences. Love? Perhaps, yes. But there are other important things on the horizon for this thoroughly modern young couple. Money and power. Below the young man is an even younger one, a youth, whose similarity of face to the one above suggests he might be the younger brother. He is clearly enjoying it all immensely - almost falling off his chair with excitement - because it is, after all, jolly good fun. It’s the day the circus came to town. And the chap running the show is really so outlandish in his disordered clothing and long, unkempt hair. What larks! One day the boy might remember this evening, and it will alter his life. He will see its consequences in his local neighbourhood when clever men like those around him will put up a cotton mill or a hospital. But not just yet. Next to the boy, on his own, is a far more serious gentleman. A watch is in his hand. Fond of new-fangled things and of accuracy, he doesn’t waste time. He measures it. How long will it take before the creature in the glass bowl loses consciousness? This is important stuff. And he will not be persuaded of anything unless it can be proven and demonstrated clearly. Maybe he will go home and write it all up in his diary. He could be an academic, a local doctor, a teacher or a gentleman farmer, someone used to dealing with creatures and their needs - air being a new one to add to the list. This is the age of the Enlightenment, after all. Technology, for him, is preferable to faith. And you can feel important if you understand these things and can speak about them with authority. But not everybody in the painting is so dispassionate. It's time to take a close look at the figures to the right: the two young girls in the company of what would probably be their father, and a single gentleman seated to the side. The two girls might be sisters - and quite well-to-do young ladies, as well, with their silks gowns and strands of beads or pearls in their hair. Derby, at the time, was an important centre for silk weaving, and the little sashes of blue silk around the waist and as headband of the eldest are beautifully rendered. The girls are, however, clearly moved and upset by what is taking place. And it's not simply a matter of squeamishness among those who have led sheltered lives. It is a genuine distress - a sentiment that would have been very much shared by adults at the time. These words, remember, are voiced in a period where bear-bating or public executions are still common forms of entertainment! What we today would consider cruel was to the Georgians perfectly acceptable. In this conterxt, those who showed themselves to be dishonourable or dishonest were ripe for punishment, while those creatures who were inherently brutal or violent, bears, dogs, foxes, and so on, were candidates for the horrors of the ring or the hunt. But there were notable exceptions. God’s fairest creations, uncorrupted and in their innocent state, were different. The meek of the world: birds flowers, children, and so on, were to be venerated (and still are, of course). Thus, the two girls resonate with the creature in the glass bowel because of their shared innocence and naive simplicity. The suffering of the bird is their suffering, and also that of everyone else present, whether they know it or not. The man above the two girls, most likely their father, is having none of it, though. He has an air of authority about him. We are probably in his home; he has paid handsomely for the man to do his demonstration. And some of his well-to-do neighbours have come over for the evening. Although perhaps a little embarrassed that his daughters are upset by what they see, he has resolved to be firm with them. He is assuring them that all will be well, that the bird will not die. It will, instead, be rescued by the clever man at the last minute by a turn of a key at the top of the apparatus. This is important. The bird, a white cockatoo, is most likely a household pet, as indicated by the open door to the cage in the top right of the composition. And this is the great oddity and paradox at the heart of the painting. The cockatoo, a breed of parrot, was a rare and expensive item in England at that time. The likelihood of this valuable creature ever being considered for such a risky enterprise would have been remote, to say the least. What is Wright trying to say by placing this precious bird centre stage and in such peril? The answer is to be found when we consider the remaining figure, lower right. The man seated in the lower right of the picture is not observing events - at least not any longer. Having removed his spectacles, he is lost in thought. He might be a philosopher of sorts, or a clergyman, and clearly the implications of what is taking place have given him cause for concern. The world was becoming a place of contradictions and uncertainties, a world of great machines, of factories, railways, and social engineering on a hitherto unprecedented scale. Some are aware that their communities are situated at a tipping point, about to alter so very fast and that as one guiding light dims, another perhaps more dubious one is beginning to take its place. The men in the Lunar society were not atheists. They were still governed by Christian principles and philanthropic ideals. They, and others like them, would continue to pursue good works right through the Georgian, Regency and Victorian eras, building civic amenities, town halls, baths, hospitals, libraries for the benefit of the poor. But they were also interested in the means to that end, of making money. They wanted to harness the forces of nature. They wanted to advance the cause of industry and commerce, which paradoxically exploited the labour of the poor. Perhaps this gentleman is thinking of all this and is anxious. He realises that an experiment of this nature would have been unthinkable just a few years ago. What is occurring in this small drawing room in Derbyshire is indicative of much greater changes taking place not only in English society, but in the very consciousness of humankind. Where is it going to lead, this curious, cynical impulse? Where are people going with this insatiable urge to delve into nature’s mysteries - a process in which even the most beautiful of creatures has become fair game for exploitation? This gentleman seems to fear the worst. So, by this stage, we have all ten figures in the painting accounted for. Each has his or her unique emotions. And each is informing us, the viewer, even at a distance of some centuries, of what might have been discussed at those monthly meetings of the Lunar Society. But there is just one further important presence in the painting. It is one we cannot see, at least not directly. We have already noted how the breath was associated with the sacred. And that, in the arts, this inhaled spirit was conveyed through the metaphor of light. Remember those earlier religious paintings of artists such as Caravaggio or Rubens in which the focus of a composition was often associated with the very source of light itself. We are meant to become ‘illuminated’ or ‘enlightened’ when we look at these works. Inspired. 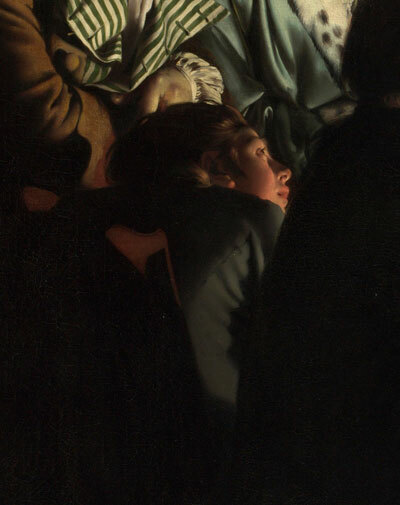 The light in Joseph Wright’s painting is not entirely obvious, however. It seems to be coming from within or just behind the specimen jar on the table and from where its radiance illuminates the faces of those present as well as the bird in the bowl above - whose similarity to the depiction of the Holy Spirit in Christian iconography is also far from accidental. If we assume that what is held in the specimen jar is not, as has been suggested, a skull, but instead a set of lungs (not necessarily human), then this would be a worthy source of divine light, indeed. The organ of breath, albeit somewhat shrunken in this instance, at the very focus of the composition. It is separated now from the body now, of course. An object of curiosity. But it gets worse - because the bird above it is not the white dove that we would normally expect as representing the Holy Spirit of the Trinity. It is, instead, a cockatoo. A parrot. No longer the Word of God, it is a creature that merely mimics speech, appearing clever but without any real understanding. Has the once sacred Word now become merely a mindless prattle? Has the breath of life now become diminished so far that it can be presented as a desiccated organ in a specimen jar? Everything seems disjointed. It is a society presided over by a parrot that dances to the tune of a human master - one who has the power of life or death over its body but little else. The Baroque Rubens's dove and Wright's parrot. The slightly deranged, messianic figure in the centre controlling the air pump is the Future, therefore. The new arbiter of Reason. He is also a strange kind of precursor to the dark Gothic Romanticism of the novel Frankenstein - still to come in a little less than fifty years from the date of this work. The new age that the man commands can either be harnessed in order to celebrate life and to ameliorate the suffering of humanity, or it can be used to dominate and perhaps, ultimately, to destroy it. And so, finally, we turn to the figure towards the top right of the painting - the young man by the window. Detail from the painting, upper right. 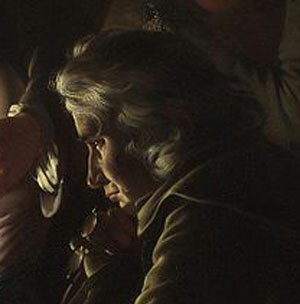 His resemblance to Joseph Wright himself (compare to the self portrait) is pretty clear. At least I have always thought so. Comparison of the young man at the window (left) with Joseph Wright's own self-portrait. He is also the only one among the many people in the painting looking directly at us, making eye contact. (The central figure operating the pump does not do this, by the way, despite what some pundits assert. He is, in fact, looking into mid-distance while speaking. Self-occupied.) The young man lurking in the shadows and attending to the curtains is the one who is addressing us. It is his narrative, communicated to us over a distance of centuries. I wonder if it might be one of the most compelling images of 18th-century British art? It is a youthful Joseph Wright - more youthful than the artist was at the time of this work. It reminds us that the future for him is still open and unknowable. Is he about to raise the curtain further to let in the light of the moon? Or is he, the last Endymion, about to lower it and conceal its face forever? We must each of us decide for ourselves what is about to occur. 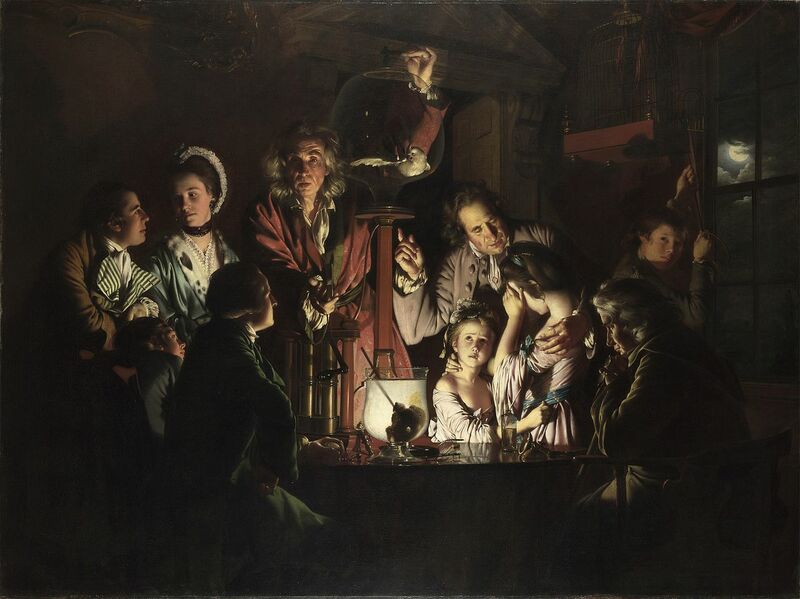 One thing I do know: ‘An Experiment on a Bird in the Air Pump,’ executed at the very dawn of the Industrial Revolution and the modern age, is surely (despite its rather unglamorous title) one of the most extraordinary paintings ever made. I found it an enormous source of inspiration when writing my Georgian-era novel WILDISH, and I hope you have enjoyed my humble attempt to fathom its secrets here in this article. There are surely many more yet to be discovered. When Queen Victoria met the poet Tennyson. Poets for Halloween. 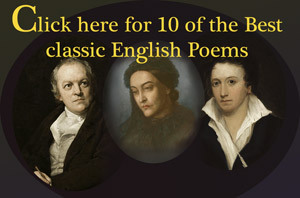 All about Bryon, Keats and Shelley. 2019, 2018 2017, 2016, 2015, 2014, 2013, 2012, 2011, 2010.